In the fourth book of this award-winning series, author Richard Konicek-Moran explores 15 new mysteries children and adults encounter in their daily lives. Relating the mysteries to experiences familiar to elementary and middle school students—Party Meltdown examines ice cubes melting at different rates; Baking Bread explores the importance of yeast; Stuck! uses a playground sliding board to explore properties of friction—the stories show how science is part of everyday life and initiate inquiry-based learning by leaving each mystery without an ending. Students identify the problem to be solved, formulate questions, form hypotheses, test their ideas, and come up with possible explanations. The mysteries cover science concepts such as periodic motion, thermodynamics, temperature and energy, and sound and sound transmission. Students may read and discuss the stories in small groups or take turns reading the stories aloud for whole-class discussions. 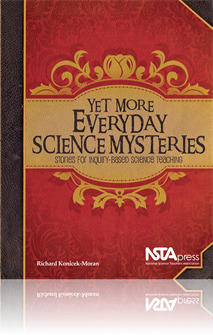 Each story also includes strategies for teaching the lessons to younger students, lists of related ideas from the National Science Education Standards, and related books and journals that can be used to continue the discussion. The author also includes a chapter on using the stories to emphasize the importance of both science and literacy.